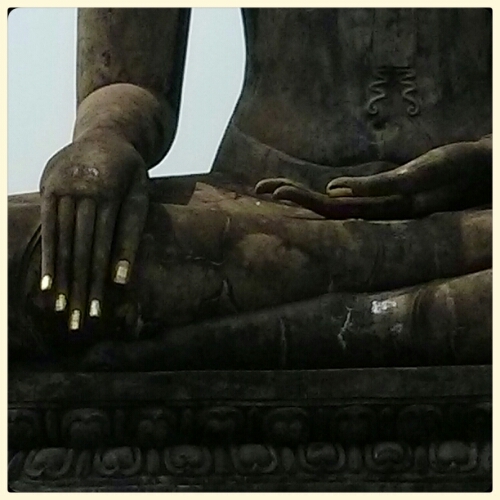 At the UNESCO heritage village of SukhoThai, the seated Buddha in bhoomisparsh mudra. Elegant, graceful, serene. Nina and I got there early is, on a scooter (with helmets, thank you very much) and explored much of the old ruins on foot. A lot of people had the same idea though. We saved the best for last and although it got hot, at least the crowds had thinned. We got a private audience with many Bodhisattvas and Buddhas. The audio guide was useful, but the site map was confusing. And no one told us there was a separate entry fee for the other older park, but we snuck into a section of the old kilns anyway. I think two nights in the city were plenty, and we stayed in such a fantastic Ruen Thai hotel, made in the old Lanna style with solid teak, structured around a swimming pool. Great breakfast, helpful staff, free bicycles, sturdy tree furniture. And a bus stand pickup we somehow missed. Oh well. Still a superlative layover.